Leader of the Indigenous People of Biafra, IPOB, Mazi Nnamdi Kanu has rejected the bail granted to him on Tuesday. A source close to him told DAILY POST exclusively that Kanu had vowed to remain in Kuje prisons with his co-accused persons. 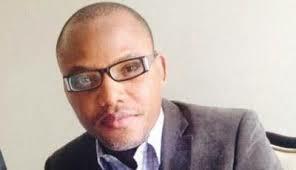 The Biafra agitator was granted bail on health grounds by Justice Binta Nyako. ‎However, bail was refused his co-accused persons – Mazi Chidiebere Onwudiwe, Mazi Benjamin Madubugwu and David Nwawuisi. According to the top source, who put a call across to DAILY POST, ‎”I just finished speaking with Kanu. He has vowed to remain at Kuje prisons pending when his co-accused persons are granted bail. “He made it clear that these other three persons were arrested because of him (Nnamdi) and as such he can’t abandon them there. Meanwhile, IPOB has reacted to the bail conditions, describing them as childish. In a statement by the Media and Publicity Secretary of the group, Comrade Emma Powerful, he said the bail conditions were designed by politicians. The statement reads:‎ “The indigenous people of Biafra, IPOB and it’s leadership worldwide commend those who put pressure on Nigerian Government and her judiciary to release our leader, Mazi Nnamdi Kanu, who has been in detention illegally since October 2015. “The bail conditions which are most probably designed by politicians who are afraid of our leader’s popularity is too inhuman, childish and stringent. “The oppressors are afraid of leader’s popularity and they hope to cage him through this funny bail condition, we are not excited, we demand the release of our members detained alongside him. “It is unacceptable to the entire members of IPOB worldwide that the presiding judge Hon. Justice Binta Nyako attached condition towards the release of our leader Mazi Nnamdi Kanu. “The Federal Government and their judiciary through justice Binta Nyako banned Mazi Nnamdi Kanu not to grant press interview, not to sit with more than 10 people or have any gathering. “However, granting conditional release to our is unacceptable to us because he committed any crime against humanity or Nigerian state, we wondered why Binta Nyako would prefer to attach conditional release him. “Again, justice Binta Nyako refused to grant Mazi Chidiebere Onwudiwe, Mazi Benjamin Madubugwu and David Nwawuisi bail who has been detained with our leader Mazi Nnamdi Kanu since almost two years. “We also thank the civilise Nations in United Nations, Amnesty International, Human Rights Watch, American Government, Israeli Government, Russian Government, European Union and others who prevail upon the Nigerian Government and her judiciary to grant our leader bail.